Production: 40 Acres and a Mule Filmworks; distributed by Universal Pictures; color (DuArt); running time: 118 minutes; Dolby SR; length: 3,292 meters (approx. 10,598 feet). Released 30 June 1989; filmed in Brooklyn, New York; cost: $6,500,000. Producers: Jon Kilik, Spike Lee, and Monty Ross; screenplay: Spike Lee; photography: Ernest R. Dickerson; editor: Barry Alexander Brown; sound: Tom Fleischman and Skip Lievsay; production designer: Wynn Thomas; costume designer: Ruth E. Carter; music: Bill Lee. Cast: Danny Aiello ( Sal ); Ossie Davis ( Da Mayor ); Ruby Dee ( Mother Sister ); Richard Edson ( Vito ); Giancarlo Esposito ( Buggin' Out ); Spike Lee ( Mookie ); Bill Nunn ( Radio Raheem ); John Turturro ( Pino ); Samuel L. Jackson ( Mister Se-or Love Daddy ); Rosie Perez ( Tina ). Awards: Los Angeles Film Critics Association Awards for Best Picture, Best Director (Spike Lee), Best Music (Bill Lee), and Best Supporting Actor (Danny Aiello), 1989; New York Film Critics Circle Award for Best Cinematography (Ernest R. Dickerson), 1989; National Film Preservation Board (USA) selection for the National Film Registry, 1999. Lee, Spike, Do the Right Thing: A Spike Lee Joint , New York, 1989. Reid, Mark A., Spike Lee's Do the Right Thing , New York, 1997. Sanoff, Alvin P., "Doing the Controversial Thing. 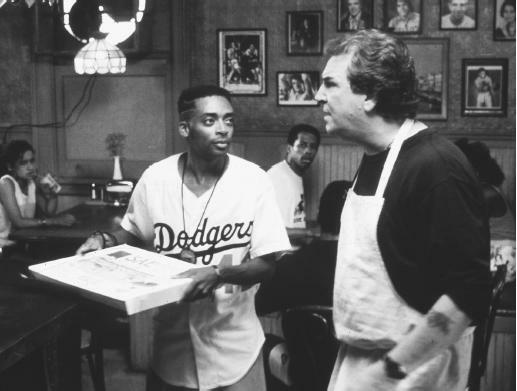 (Director Spike Lee's Movie Do the Right Thing )," in U.S. News & World Report , 10 July 1989. Johnson, Victoria E., "Polyphony and Cultural Expression: Interpreting Musical Traditions in Do the Right Thing ," in Film Quarterly (Berkeley), Winter 1993. Lindroth, Colette, "Spike Lee and the American Tradition," in Literature/Film Quarterly (Salisbury, Maryland), January 1996. McKelly, James C., "'The Double Truth, Ruth': Do the Right Thing and the Culture of Ambiguity," in African American Review (Bloomington), Summer 1998. Radtke, Jennifer, "Do The Right Thing in Black and White: Spike Lee's Bi-Cultural Method," in The Midwest Quarterly (Pittsburgh), Winter 2000. Before the release of Do the Right Thing , Spike Lee had made a name for himself as an independent filmmaker who helped to spearhead the rise of film festivals as a market place for independent cinema in the late 1980s. His first two features, She's Gotta Have It (1986) and School Daze (1988), were unique not only because they were made outside of a studio on shoestring budgets and featured primarily black actors, but also because they managed to get mainstream distribution and turn a modest profit as well. The industry cachet these two films earned Lee enabled him to make Do the Right Thing , which was inspired by an actual incident in Howard Beach, New York, in which a group of white kids chased down and killed a young black man. The result is a brilliant film about racism in America that many consider Lee's best to date. American Brooklynites to boycott Sal's Famous, which in part leads to the film's electrifying climax. The catalyst to the film's rising racial tensions is the heat. Accordingly, Lee's mise en scene is carefully constructed so as to visually convey the oppressiveness of Brooklyn's dreadful heat and humidity in the dead of summer. The film as a whole was shot in saturated color, thus rendering the summer heat almost palpable. In addition to close ups of his characters' faces drenched in sweat, Lee time and again features the color red as dominant in the various frames. The characters constantly lament the heat as they all the while move slowly so as not to exert any more effort than absolutely necessary. Further contributing to his audience feeling as ill at ease as his characters is Lee's repeated use of discomforting Dutch angle shots. As the heat slowly rises, so too does his characters' volatility. The tensions that build throughout the film eventually explode in what is among the most controversial endings in cinematic history. The differences between the Italians and the blacks in the neighborhood are accentuated by Lee's skillful use of music to compliment his characters' ethnicities. While the Italians favor Sinatraesque ballads, the African American characters frequently listen to rap, most notably by Public Enemy. This all comes to a head when Radio Raheem refuses to turn down his radio while in Sal's. Sal and Radio get in a fight and the police are called. An ugly situation turns worse when the police arrive and kill Radio in their efforts to subdue him. The crowd outside of Sal's, gathered by Buggin' Out to protest Sal's ethnically singular wall of fame, quickly turns into a mob. Mookie starts a full scale riot by throwing a garbage can through Sal's front window. Bedlam ensues as Sal's is first looted and then burned to the ground. This scene forces viewers to take sides. The film's deceptive title becomes not so much an exhortation as a question: What is the right thing to do and what factors should people consider when determining what's right for them? This question has colored the wide and passionate range of critical responses to the film's climax. Its critics are angered by what they feel is Lee's slanted point of view, a frequently cited example of which is the pointed graffiti—"DUMP KOCH"—in the background of many scenes (at the time of filming, New York Mayor Ed Koch, who many blacks felt was ineffectual in his dealings with racial issues, was running for re-election; Lee was openly opposed to his re-election). Conversely, the film's champions claim that Do the Right Thing is remarkably evenhanded in its treatment of race, thus leaving it up to viewers to decide just what the right thing is. As Alvin Sanoff writes, in discussing his film Lee has said, "It wasn't made to incite riots but to provoke discussion about racism, something people do not want to talk about." Ultimately, whether one sides with the film's defenders or its detractors is beside the point; in arriving at their own conclusions, viewers can't help but consider the state of race relations in America, which in the end is what Lee most hoped to accomplish by making Do the Right Thing , the amazing film that, along with Malcom X , will likely be his cinematic legacy.